When I came into Cambodia the drunk customs official just passed me through the border without any paperwork, and I thought I might have some problems leaving. When I got to the Cambodian departure area there was a little booth with two young guys in uniforms and tags that read “trainee”. They asked for my carnet, which apparently I was supposed to use coming in. I think it’s possible to pay a temporary import fee to ride in Cambodia, but using the carnet is free. I explained that the guy was drunk and wouldn’t do any paperwork for me. Finally they just smiled looking a bit confused and let me pass. I figured I was home free, but not yet. When I tried to do the customs on the Laos side they asked for the bikes Cambodian departure stamp, which I obviously didn’t have because I hadn’t gotten an entry. I tried showing them different paperwork and explaining the situation, but they weren’t interested. I was forced to go all the way back, and since Laos had my passport Cambodia wouldn’t let me ride past the gate and I had to walk. I was pretty much trapped in between the countries. Laos wouldn’t let me in without a Cambodian exit stamp, but I was already out of Cambodia. The two kids at the booth couldn’t do anything with the carnet. They showed me a form, which was for temporarily importing a vehicle and said I could pay $20 for it. I said no way, and that it was their fault for not doing my carnet when I came in. They talked to each other and tried to make some calls, but when they couldn’t get ahold of anyone they just filled out one of the forms, stamped it, and gave it to me for free. Laos was happy with this and made some paperwork for my bike with a little piece of paper that said “outbound vehicle charge 24,000kip”, which is only three bucks, but didn’t make sense because I was inbound. I’m not sure if it’s something official you have to pay. I had sixty left over thai baht in my wallet, which is less than two dollars, and gave it to him. He was happy with this, which makes me think it’s not too official and it’s for their pockets. The visa on arrival is between thirty to forty dollars depending on your country. They have a little scheme going where you fill out the application and hand it in at one window, and then at a second window is where they do the stamp. When you get to the second one the guy tells you you need to pay a two dollar stamp fee, pretty funny. It’s complete crap and is straight to their pocket, but they have the stamp and all the power. Try and not pay because it’s the principal. I had sixty cents of left over Cambodian riel that I gave him. He complained and told me it was my lucky day, and stamped me into Laos. I loved Laos the first time I went, and it felt great to be back. Making your way up Hwy 13, the mighty Mekong River is just a short way off to the left. There are many small roads that lead a couple km down to the river. What an awesome river it is. Flowing about 4,350 km, it runs from the Tibetan Plateau, through China’s Yunnan province, Burma, Thailand, Laos, and Cambodia before draining into the complex delta system of the in Vietnam. You can find everything from huge wide slow flowing sections to gushing rapids through boulders. The river is one of the richest biodiversity areas in the world with 20,000 plant species, 1,200 birds, 800 reptiles and amphibians, 430 mammals, and an estimated 850 fish species. Many new species are discovered every year. The freshwater Irrawaddy dolphin used to be common in all of the lower Mekong, but now there are only around 85 left. The river has been a lifeline for cultures throughout history. Europeans tried to exploit the river for trade opportunities, but found there to be too many falls and rapids. I slowed right down into the Laos way of life and explored a few of them finding shaded spots along the water. It was getting later in the day and I stopped for some lunch at a small restaurant. Turned out to be a guy who had been a mechanic for the US air force and had fled to San Francisco when the US was beat out of the country. Him and his wife raised five or six daughters, who all still live in the states, and he worked collecting the money from parking meters for a long time until getting his pension, and retiring back to Laos. Really friendly people, and his wife makes some of the best noodle soup. I ate lunch with him and had a nice chat. The old guy who hangs out cracks me up, I’m pretty sure his job is to just keep out the chickens all day. The road next to the restaurant led down to the river. 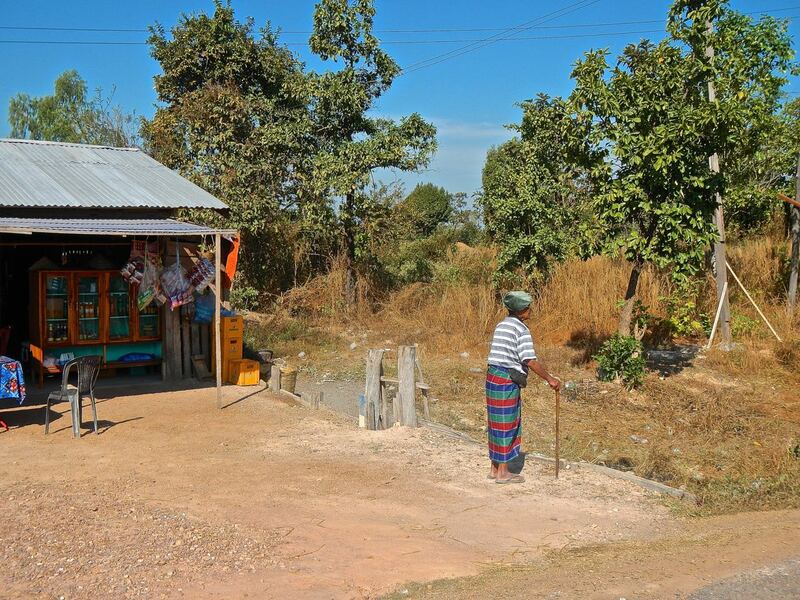 A few km leads to the village of Ban Nafang Yai along the banks of the Mekong River. In the small villages along the river they have a small road/path along the water which connects all of the houses, and usually has beautiful views. The village has a nice temple right on the river and is right next to the school. I parked at the temple the exact moment school let out and all of a sudden I had fifty kids swarmed all around me. They studied me closely and curiously watched my every move. Little things like unzipping my tank bag brought ooos and aws from the crowd. They wanted to see everything I had in my cases. I couldn’t help myself and scared a bunch of them half to death with the fake snake, showed them some shells from Thailand, and played with the booth apps on my tablet giving some mustaches and bald heads to the kids. I did it with a picture of their teacher and it got the greatest reaction ever. I’m not sure if the teacher liked it. It was getting late so I asked the monks if I could camp at the temple and it was no problem. I set up my camp with at least thirty kids circled around intently watching. I’m sure they’d never seen a tent before, and was probably very strange seeing this big white guy show up sleeping in one. At this point I had an entourage that accompanied me everywhere I went. We all went swimming in the river before sunset. We had races, and either I’m out of swimming shape or those kids are ten year old Laos versions of Michael Phelps. It was a un afternoon goofing around, playing with my camera, and watching a gorgeous sunset over the Mekong. The oranges got deeper and deeper, and the temple behind us sparkled. About twenty of us were watching the final pinks squeeze out of the sky when the old monk came over and shooed all the kids away. I ended up back at the same restaurant for noodle soup dinner, and actually for breakfast too. The stars were incredible at night. They reminded me of the stars in the mountains of northern California where they glimmer and twinkle. Some of them get so bright and flash other colors to where it plays with your mind. It was a perfect first camp in Lao under a large mango tree next to the main temple. As soon as I climbed to of my tent at sunrise, I had a crew waiting for me. They were probably hiding around the corner waiting for me to show my face. For the first time in a long time, it was cold, really cold. Me and my friends warmed up next to a fire that the monks had built. Up in the tower, one of the young monks beat the drum to welcome the new day. I had been wishing I had something to give as little gifts sometimes to the kids. When I was packing my top case, they saw my bag of golf balls and yelled “golf”. Somehow these kids who hardly spoke a word of english knew what a golf ball was. They were really excited for them, so I gave them all one. For some reason I had been carrying them with me since Australia and felt like they would come in handy at some point, and I’m glad I did. It was worth it to see the happiness they brought them. Thanks for taking me in for the night. 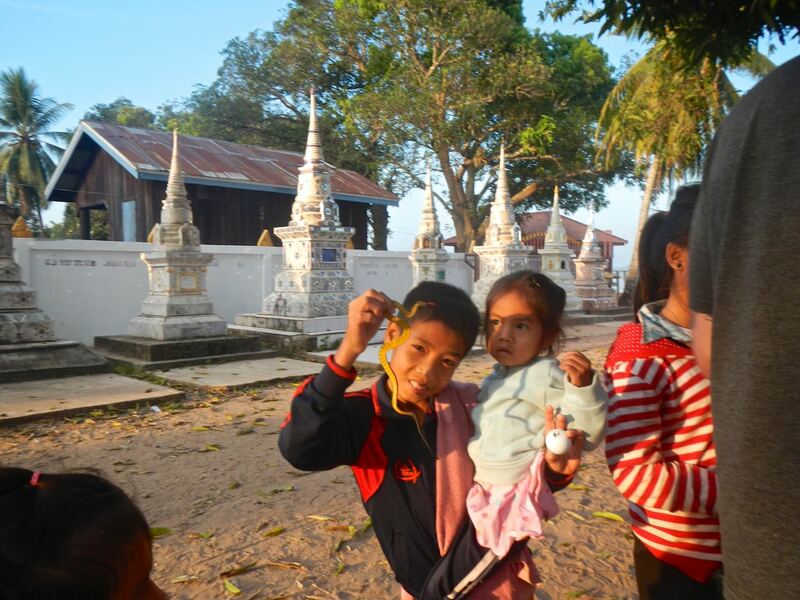 This entry was posted in adventure travel, border crossing, camping, Laos travel, locals, Motorcycle world travel, Photography and tagged adventure, buddha, camping, children, laos, laos border crossing, mekong river, motorcycle, photography, school kids, temples, travel. Bookmark the permalink. What an adventurest and wonderful time :). Sending much love!! You are an ambassador for us meeting people of the world, especially these children! They won’t forget you & the good impression and laughs you gave them. I love reading about your adventures, and seeing all the cute kids. Such a wonderful experience your sharing with us.